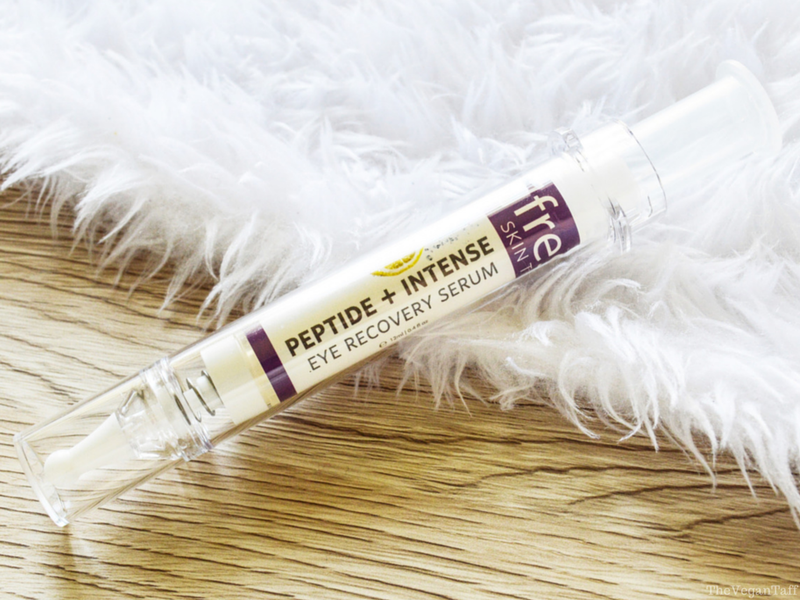 After my recent experience with facial serums (which you can read here and here), I jumped at the chance to try out a vegan eye serum, which is one skin care product I've never used before. Refresh Skin Therapy is a new brand to me, and I only posted their animal testing policy a few weeks ago, so I was eager to give the brand a try. 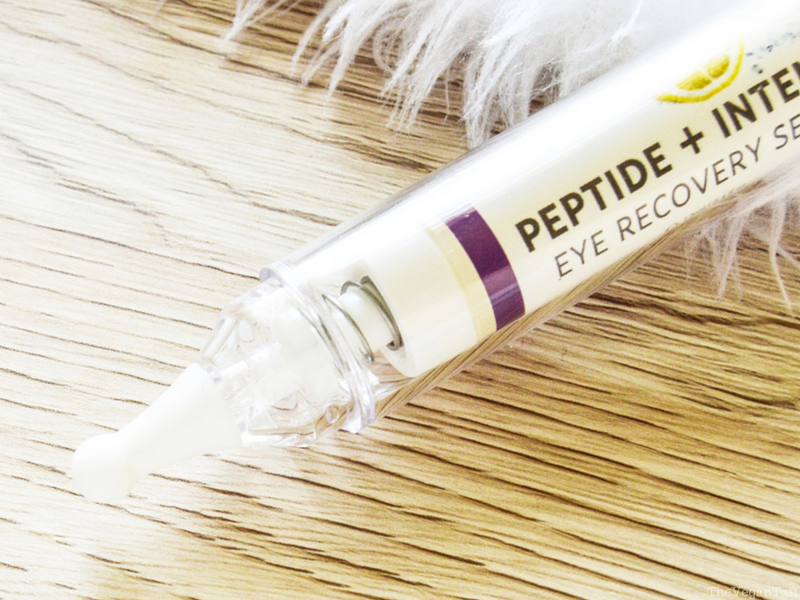 The Eye Recovery Serum* is said to be good for dark circles, wrinkles, bags, and puffiness, they're some pretty big claims. 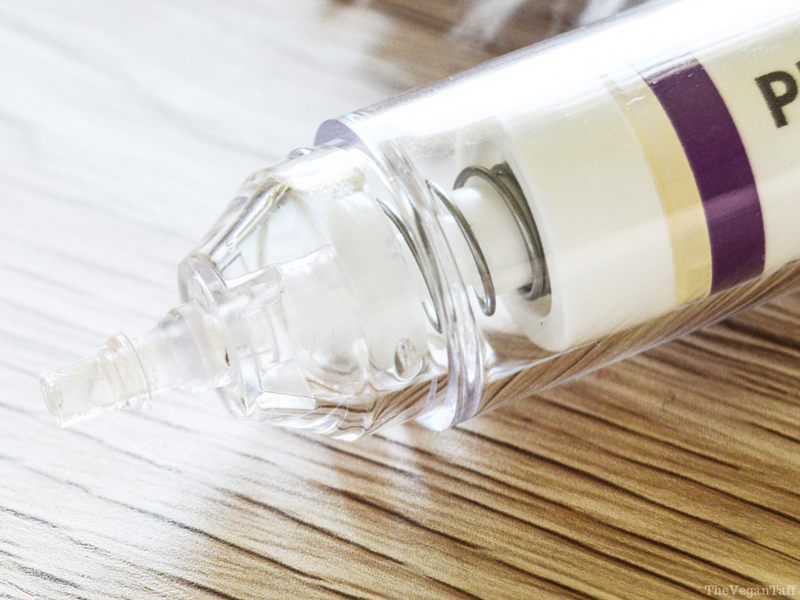 The serum comes packaged in a heavy plastic syringe, with two caps; one clear outer cap and a white rubber stopper to prevent any serum leaking out while it's not in use. I really like this attention to detail, and it works perfectly by stopping any waste. To use, you simply remove the caps and apply a small amount of pressure on the end of the syringe. It's just stiff enough to make it easy to control but not so loose that you run the risk of ejecting too much product, which is essential with packaging like this because you can't put it back in the tube if you pump too much out. The serum is clear and scent free, which I was happy to see considering it's going to be applied to my eyes, and I do have a tendency to be quite sensitive in that area. The photo below shows how much product I need to use each time, and that's for both eyes. I simply spread it between my two ring fingers and tap all around the eye area, up to the brow bone and down to my cheek bones. This tiny bit of product really does stretch pretty far. The serum sinks in incredibly fast, it allows you enough time to move it around, but be quick because as soon as it hits your skin it's going to start absorbing. Once applied there's no film on the skin or any feeling of product at all, it just disappears. I use this both morning and night and always follow up with my eye cream and I find that it helps that to apply smoother and more evenly, meaning I have to use less product each time. I've been using this for over a month now and am pleased to say that I haven't had any negative reactions at all, even when I'm clumsy (which is a lot) and get it in my eye, it doesn't sting or cause me to tear up. Although I wouldn't recommend getting any beauty product in your eyes, at least you know if you do it shouldn't be a problem. As for the claims that the serum helps wrinkles, bags, dark circles, and puffiness; I have to say that I do somewhat agree. I don't have serious wrinkles yet, but I do have fine lines and I don't feel that it's really affected those much at all, but maybe it will prevent wrinkles coming in the future, who knows? The other three claims I do believe, which has shocked me. The last few weeks I've only been getting around three hours sleep a night, and that would usually leave my eyes looking swollen, dark and heavy, but they don't. In fact I look fairly rested, even though I'm exhausted. This is the only new skincare product I've tried over the last couple of months so I put it all down to the serum. Not only that, but it also helps my eye cream absorb quicker by pulling it into the skin, so my under eyes are more hydrated than before. I have to say that as much as I really, really like this product I'm a bit disappointed. Not because there's anything wrong with it, quite the opposite in fact. Because the serum is so expensive I was hoping I wouldn't like it at all, and then I wouldn't feel the need to buy it again, but it's exceeded my expectations and now I feel like I have to have it all the time. I just can't believe how well my eyes look considering the very little rest I'm getting, and knowing that a product makes you look, and more importantly feel, so much better, how can I not keep using it? Although I expect to get a good four or five months use out of this one tube, spending the better part of £50 on a beauty product is something I'm not looking forward to, but will because I really think it's the best eye care product I've ever used. Refresh Skin Therapy Eye Recovery Serum* is available from Amazon UK for £48.50, or from the company's US website for $49.95. If you're in the US, the serum is available from Amazon for just $29.50. I'd love to hear your thoughts on this review, and if you'd consider spending so much on a skin care product.